Winter Garden, FL — New homes are changing to meet the requirements of today’s three generation families. At Canopy Oaks in Winter Garden—an intimate neighborhood of 58 luxury homes—developer Mason Simpson and builder A.R. 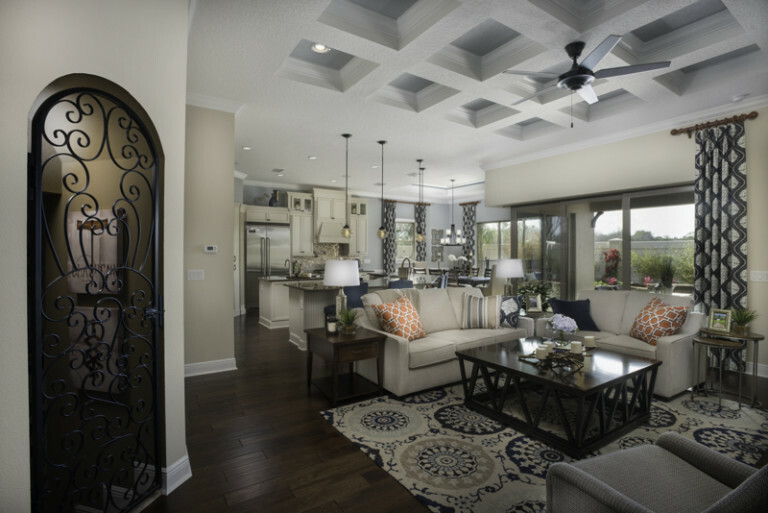 Bailey Homes have accounted for Orlando’s growing market of multi-generational households. The homes at Canopy Oaks boast four to six bedrooms with options of two master suites, one up and one down—to provide privacy and a true refuge for mom, dad, the kids and the grandparents. Each master suite includes a lavish bath—both with free-standing soaking tub, and a large, easily navigated open walk-through shower. Three car garages organize and shelter the fleet of family cars, and a public school bus stop at the community entry gate helps the children get to school on time. The Canopy Oaks community features a security camera at the bus stop so parents can check on the kids waiting for the bus from their smartphones from work, home or anywhere they have cell phone access. A-rated public and private schools surround the location. College-aged students that commute from home will find an expressway on-ramp four minutes from home. Preparing breakfasts, lunches and dinners is made easier in a kitchen equipped with double kitchen islands and a cleverly hidden walk-in pantry. The gourmet chef’s dream kitchen with Viking appliances includes a six burner natural gas cooktop. These same features make hosting a creative dinner party for up to 18 a breeze. An old-world walk-in wine cellar with a wrought iron gate showcases the owner’s collection of fine wines while making a luxurious impression. Hideaway telescoping sliding glass doors open to allow the party to flow seamlessly outdoors. Perhaps most innovative of all is Canopy Oaks’ concept of two great rooms—one upstairs and one down. Here, children or grandparents enjoy an extra sun-filled open space for homework and hobbies. A home theater with wet bar provides another great family retreat. Finally, for the parent who has little free time for home maintenance, backyards have been designed with waterfall pool, spa and weather-resistant decking. Low HOA fees are another plus of Canopy Oaks ownership. 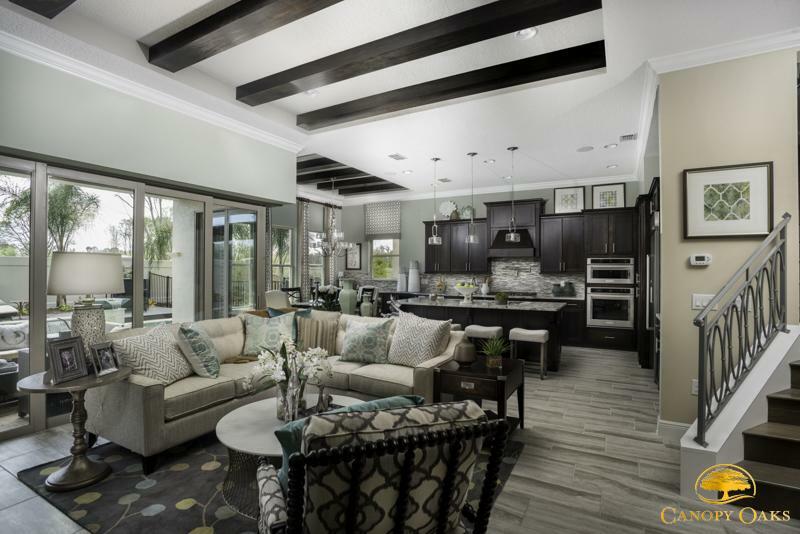 The Southeastern Builder’s Conference judged new homes all over Florida and awarded Canopy Oaks its highest award for a new home in its price category of $500,000 to $1 million. Canopy Oaks’ new definition of luxury living has become the “talk of the town”. Over 500 nearby residents toured Canopy Oaks during the first three weeks of the Central Florida Parade of Homes recently. Buyers gravitating to Canopy Oaks are Disney executives, medical professionals and Orlando professionals –many attracted by home designs perfectly suited to multi-generational families. For more information, www.CanopyOaksFL.com. Models are open daily at 12902 Roper Road, Winter Garden. Call 407-488-5588 for a private tour.